Night Mode was one of the highlights at the presentation of Pixel 3 and Pixel 3 XL, but it was not available at the release of the two smartphones. Now, Google is releasing it in a special update feature. We were able to test it a few days in advance. We've also compared it to competitors like the Mate 20 Pro, the Galaxy Note 9 and the iPhone XS. 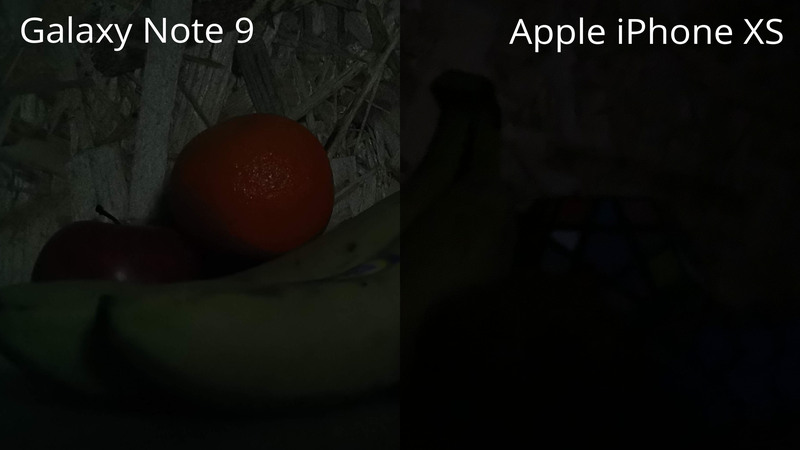 The so-called Night Mode, which is also being released for older generations of Pixel smartphones, works similarly to that of the new Huawei Mate 20 Pro camera. Between 6 and 15 photos with different exposure times are taken and then combined to complete the final picture. 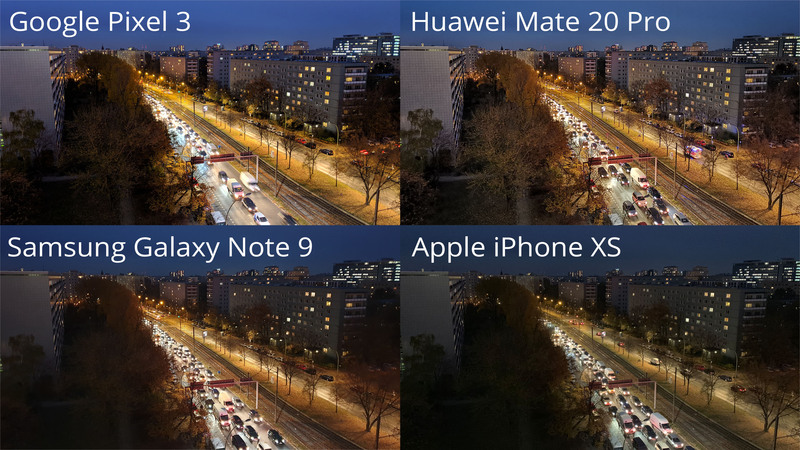 It has an advantage over the Huawei smartphone - where Huawei's night shot can take up to 20 seconds, shooting with Google's Night Mode never lasts longer than 6 seconds. The number of photos taken depends on the light conditions and how much the photographer wobbles the phone. If the smartphone is placed on a tripod, the Pixel 3 (XL) shoots six pictures with a one second exposure time each. What Pixel 3 camera was able to capture during our Night Mode test is truly remarkable. 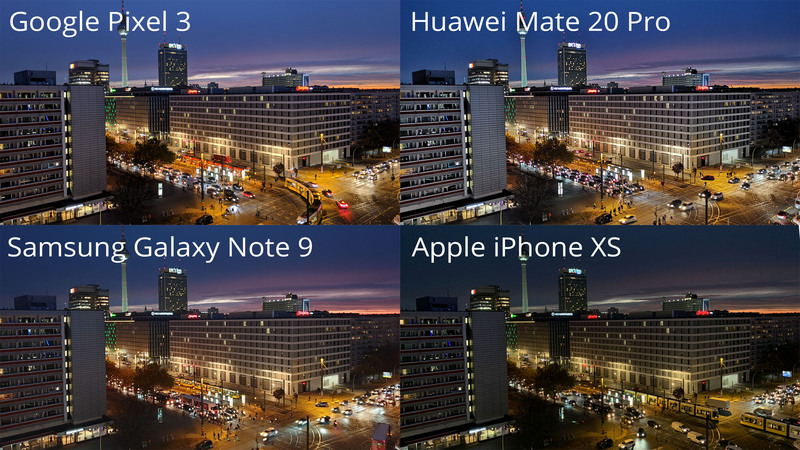 The dynamic range and color fidelity are convincing in our shots of a busy Berlin street. Even colors that cannot be seen with the naked eye are reproduced by the camera. Both can also hold their own against the Canon EOS 6D, although the DSLR has, of course, been out for a few years already. 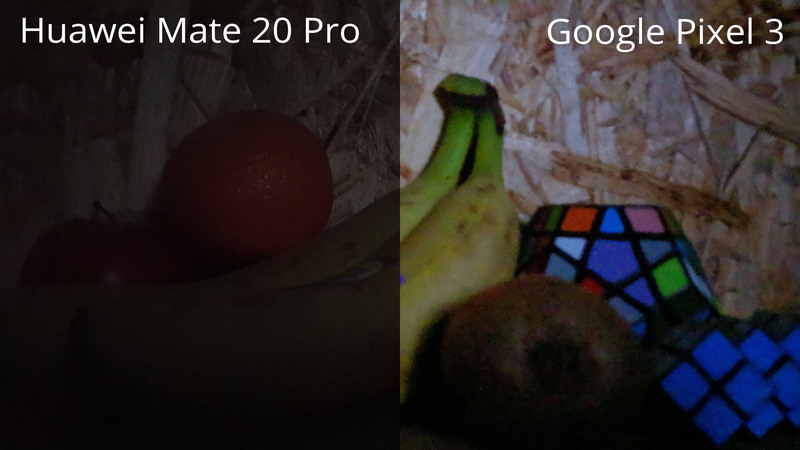 A direct comparison with the competition shows that only the Mate 20 Pro, which also offers a special night mode, can keep up. The Galaxy Note 9 and even the iPhone XS drop off noticeably in this relatively well-lit scene. Especially on the Apple smartphone, it seems quite dull in comparison. We wanted to see what Night Mode really has to offer, so we created a studio scene with hardly any lighting, and the differences became even clearer. As a reference, the sticker on the banana was just about visible to the naked eye, but no longer legible. Pixel 3 (XL) delivers a bright, detailed and colorful image. The Mate 20 Pro also brings light into the scene but delivers a much more colorless image. When you shoot a photo with Galaxy Note 9, the details get lost and noise becomes clearly noticeable. Apple's iPhones XS leaves us sitting in the dark and hardly shows more than can be seen with the naked eye and mixes it with noise and little detail. Last but not least, we have a scene that was invisible to the naked eye. Unfortunately, this doesn't get any better with the Galaxy Note 9 or the iPhone XS, since both smartphones don't manage to brighten up the scene. Unfortunately, the Night Mode on the Pixel 3 (XL) highlights a problem that Google can't fix with software, because it lacks the right hardware. Compared to the second generation Pixels, the laser focus on the latest flagship duo has disappeared. The result: the worse the lighting conditions get, the more problems the autofocus has. 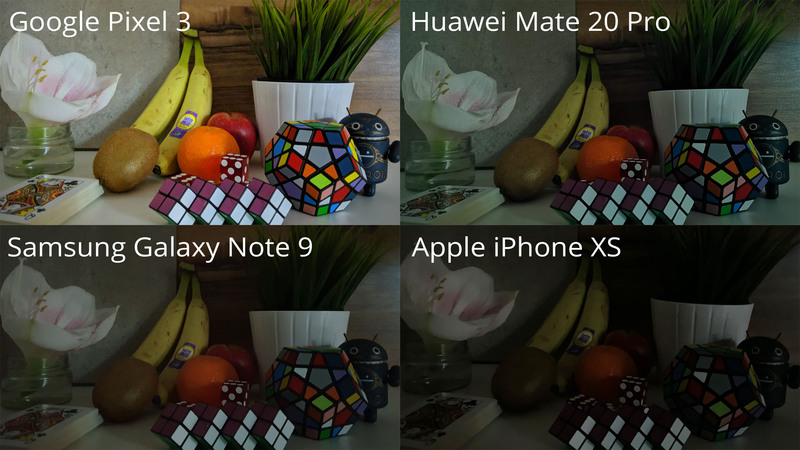 This is especially evident in these pictures because, although they are impressively bright and colorful on the Pixel 3, they are always blurry and out of focus. The option for close-up focus in Night Mode also didn't really help with the short distance. The Mate 20 Pro delivers darker and duller images, but they are still sharp. 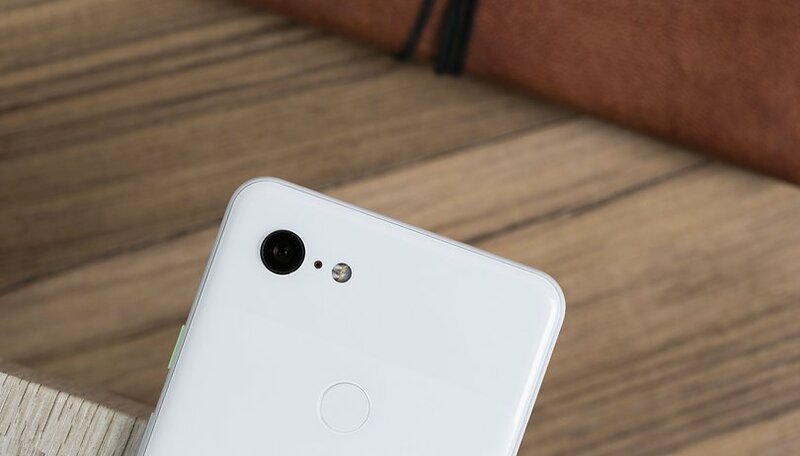 Our editor, Luca, has already criticized the problem with the missing laser focus during his extensive camera review for the Pixel 3 (XL). Interestingly, Google made blunder in terms of hardware and software is supposed to bridge the gap. Fortunately, the problem is limited to taking pictures of really close objects in very poor light conditions. This doesn't change the bottom line: Google has demonstrated once again that software has become much more important than hardware when it comes to taking amazing photos with your smartphone.